Thor learns of the terrible prophecy of Ragnarok. He must race against time and battle the Goddess of Death, Hela, to save his home and people. In order to win this almost impossible battle, he will need to form a team comprised of his treacherous brother Loki, the last Valkyrie, and the Incredible Hulk (aka Puny Banner). Together they may be able to turn the tide and save Asgard from complete destruction. First off let's talk about the Hulk, otherwise known as large green monstrous alter persona of Dr. Bruce Banner. From the Avengers films, all we ever really see from Hulk is him “smashing” various alien goons and punching out giant flying monsters. Don’t get me wrong, I love seeing the Hulk tearing bad guys apart, but I also know that there is more to him than just being a gigantic green caveman. If you’ve read a fair number of Hulk comics than you know that he has fears, insecurities, and yes even his own hopes/dreams. In Ragnarok, we see a Hulk who has not only found his place in his new home but has also been embraced and celebrated by the common people of the planet Sakarr. Also, we get to hear him speak more than just one to two lines. Some of the funniest scenes from Ragnarok are when the Hulk and Thor are bantering and bickering with each other. Second is the beautiful and nameless Valkyrie. The story of Valkyrie is told via flashbacks. We learn that she was once a member of the elite all-female honor guard of the Asgardian crown. However, unfortunate circumstances caused her to forsake her station and seek refuge on the planet Sakarr. Overall, I felt that Tessa Thompson did a great job of taking a generic war maiden character from the comics and putting some real life into her. I hope that we see the character appear again in future Marvel films. Cate Blanchett plays the Goddess of Death, Hela. Ms. Blanchett did a fantastic job with bringing the emerald villainess to life. What is interesting about Hela is that she is not the type of villain who is only evil because of a horrible past done wrong to her, nope. Hela is just evil and totally owns it. The Grandmaster was played by Jeff Goldblum. What can I say, we pretty much got Ian Malcom who runs a planet in outer space. Sorry folks, I don’t know what else to tell you. Tom Hiddleston returns as Loki the god of mischief. While Loki does not really go through any huge character developments, Hiddleston’s performance is solid and quite enjoyable to watch. Last but certainly not least is the God of Thunder himself, Thor (Chris Hemsworth). I mean this with all sincerity, Hemsworth’s portrayal of Thor for this film was my absolute favorite. His portrayal of Thor in the previous films was kind of bland. In fairness, he did not have a lot of character material to work with, the character of Thor is not the deepest reservoir of charm and charisma. As cool as Thor is with his powers and his mystical hammer, he’s not someone that many people can connect with in a meaningful way. However, in Ragnarok not only do we see Thor knocked down a few pegs we also get to see him joke around with his compatriots and the result is pure gold. The story for Thor: Ragnarok plays out more as a rag-tag team action flick rather than an impending doom and disaster film as its title would suggest. I don’t mean that as a criticism, just merely an observation from a fan of both superheroes and Norse mythology. 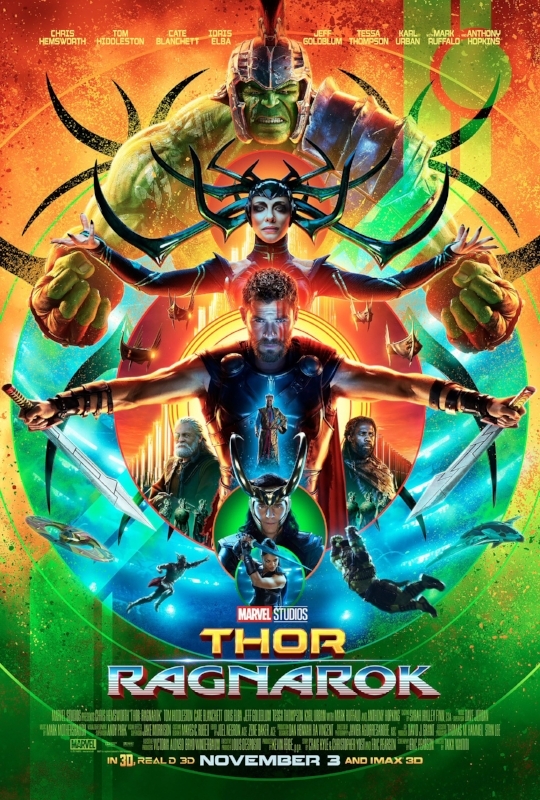 While Ragnarok has some amazing blockbuster action sequences and a few somber moments, it is a noticeably much more lighthearted movie than either of the two previous Thor films. Admittedly, I feel that this shift in the franchise’s tone is a welcomed change. The music score for Ragnarok is great and provides an awesome 1980s supercharged ambiance to heighten the Syfy set pieces you’ll see in the movie. Marvel Studios has once again given superhero fans (and fandom newbies alike) another fantastic entry into the Marvel Cinematic Universe with Thor: Ragnarok. Be sure to check it out! !